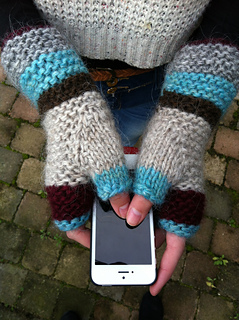 These fingerless mittens are very comfortable to wear and a joy to knit. They are knitted from Lopi wool. Lopi wool comes from a special breed of sheep from Iceland. It is a pure and honest single twined wool. The example is knitted with a Lett-Lopi thread held double on needles 6mm/US10/UK4/CAN4. It is also possible to use Alafoss Lopi. This is thicker and can be used with a single strand. I love the look of the garter stitch ridges. This is achieved by knitting a knit stitch round followed by a purl stitch round. 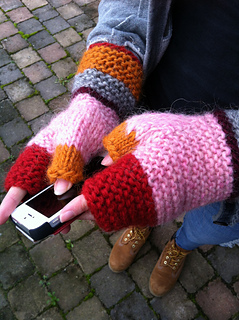 These contemporary mittens with gusset thumbs are knitted with the Magic Loop method on one long circular needle. You can also knit them on two circular needles or on double pointed needles. When finished they can be washed in lukewarm water and air dried. A night in the freezer takes care of the possible itching of the Lopi wool. The Twisted German Cast-On with a cuff of garter stitch make these mittens stretchy and comfortable around your wrists. 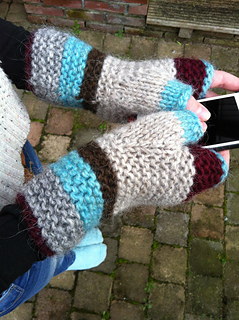 Two of the mittens pictured are knitted with all sorts of Lopi scraps and one pair is knitted with a solid colour. Needles: 1 6mm (US10/UK4/CAN4) circular needle 100 cm (40 inch). Notions: 2 stitchmarkers, scissors and tapestry needle. Gauge: 14 stitches and 12 rows = 10 cm/4 inch with needles 6mm (US10/UK4/CAN4). 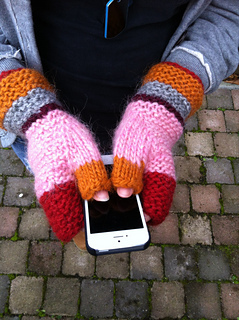 Notes: You can make these mittens from any other yarn. As long as your gauge is about the same. For the scrap yarn mittens you will need a bit more than 100 grams of wool because of the beginning and ending of the colour changes. YouTube is a great source for knitting techniques. If you search for the Twisted German Cast-on or the Magic Loop method you will find a lot of good tutorials. Increases (kfkb) are made by knitting in the front stitch and knitting in the back stitch of the same stitch. One garter stitch row is the same as one row of knit stitches AND one row of purl stitches. The directions are given for the Magic Loop Method. There are some brilliant tutorials on YouTube for knitting in the round with two circulars or with 4 or 5 double pointed needles. Skills Needed: Twisted German cast -on. Knit stitch. Purl stitch. Knitting in the round with the Magic Loop Method. Decreasing by knitting stitches together. Increasing by knitting in the front and in the back of a stitch. Backward loop. Picking up stitches. Cast off.